Etching and drypoint on ivory laid paper with wide margins. Signed in the plate "Whistler" and dated 1859. Signed and inscribed in pencil in the margin "A Madame Coronio homage respectueux J Whistler". Eighty two known impressions of all states. This is the rare third state of six showing the reduction of the slanting shading on the bow of the barge, vertical shading lines now being prominent. This etching was produced by Whistler as a trial before he produced the fourth state which was published in The Thames Set in 1871. 5 x 7 7/8 inches. References: (K.40) Edward G. Kennedy, The Etched Work of Whistler, New York, The Grolier Club, 1910. (G48). Margaret F. MacDonald, Grischka Petri, Meg Hausberg, and Joanna Meacock, James McNeill Whistler: The Etchings, a catalogue raisonne, University of Glasgow, 2012. Gift from the artist to Aglaia Coronio (1834-1906). Aglaia Coronio (nee Ionides) was the wife of Theodore John Coronio. She was the sister of Helen Euphrosyne Ionides who married Whistler's brother Dr William Mc Neill Whistler. Their father was the wealthy Greek merchant and collector Alexander Constantine Ionides. Aglaia Coronio, like the rest of her family, collected works of art and she bought a number of Whistler's paintings. Exhibition of 19th and 20th Century Masters; Etchings and Lithographs. The Leicester Gallery, London, November 1965. Situated on the north bank of the Thames opposite Rotherhithe, Whistler was looking east away from Wapping and has depicted the Harbour Master's House closest to him. Further away is The Grapes pub and Broadway Wharf is in the distance. In the distance is an advertisement for the Curtis Gin Distillery Co. Ltd. Narrow Street backs on to this stretch of the Thames. 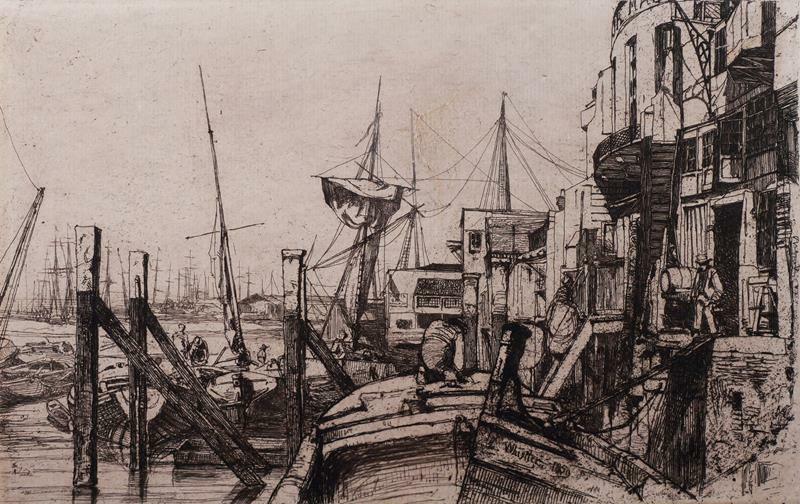 Whistler turned to the subject of the River Thames in the summer of 1859 and Limehouse was one of the areas that he depicted. The area was dangerous and infested yet the artist appreciated the picturesque disrepair of the wharfs and warehouses that lined its banks. He also depicted the working men whose lives were intimately connected to the river and placed them in the foreground where they could not be seen as incidental to the scene. The Thames set was published in 1871 by Ellis and Green as part of 'Sixteen Etchings of Scenes on the Thames and Other Subjects'. Impressions were also later available through The Fine Art Society and the artist himself. As a painter, etcher and lithographer Whistler is undoubtedly one of the great masters of the nineteenth century. Born in Lowell, Massachusetts he entered West Point Military Academy in 1851 but left to work as a cartographer for the Navy where he studied etching. In 1855 he went to Paris and came under the influence of Courbet and Manet. In 1859 he moved to London and completed his masterful Thames Set of etchings. Whistler's colourful personality led him to feud, most notably with John Ruskin and Oscar Wilde. He had many imitators including Walter Greaves and Mortimer Mempes. He exhibited in London at the Royal Academy, Society of British Artists, Grosvenor Gallery and elsewhere.